‘We welcome spirits to the light!’ Greek Drama in the Community. We welcome spirits to the light! We welcome spirits wrong or right. And drag up something to judge its worth. We chant and shout and screech and scream. But we do not appear as we first may seem. Where do you think these lines of choral chanting come from? A Penguin translation of Aeschylus or Euripides, perhaps? Or one of the many versions and reworkings of Greek tragedy which have been produced by various celebrated poets and playwrights of the 20th and 21st century? Well, you’d be forgiven for either of these guesses. But they’re actually taken from the very start of an original play being written and devised by members of the Byre Youth Theatre Adult Collaborative Performance Group. Since last summer, I have been working with this group of performers, which currently comprises four young people aged 17 and above. They all live locally in North-East Fife; some are studying for formal qualifications in theatre and performance in nearby schools or colleges. The group meets every Thursday evening in the school term. 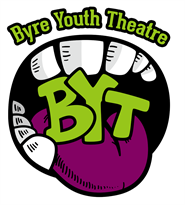 It’s managed and taught by theatre practitioner Stephen Jones of Byre Youth Theatre Ltd, a non-profit organization providing exciting opportunities and training in drama and song to children and young people. The organization has close links to the recently re-opened Byre Theatre in St Andrews. This collaboration between Byre Youth Theatre and the School of Classics has now developed into a special project called ‘Greek Drama in the Community. Working with the Byre Youth Theatre towards a devised performance’. Designed by Stephen Jones, myself and my colleague Dr Ralph Anderson, it is funded by the University of St Andrews’ Knowledge Exchange and Impact Fund. Its main aim is to explore how the content, context and conventions of ancient Greek tragedy might be used to inform and inspire the group’s work. And we hope that our experiences and documented findings will prove useful for anyone contemplating similar ventures. But this isn’t a project about ‘putting on a Greek play’ or the slavish and systematic application of ancient Greek theatrical practice. Instead, we’re using Greek tragedy as a focus for discussion and thought, as a stimulus for the group’s own creative endeavours and as fresh resource for their development as performers. So yes, I’ve talked to them about masks and the role of the Chorus in Greek drama. And both Stephen and his choreograper have helped the group to incorporate some use of masks and a powerful choral presence into their devised play. But such ancient conventions are only to be used if they genuinely serve the performers’ own vision and decision-making for the original play which they are devising. On the other hand, Stephen and I have wanted to show the performers that Greek drama can improve their understanding of theatre’s history and its social, political and cultural potential for the ‘here and now’. And we discovered that my own academic expertise in Greek tragedy could be tapped by the group as a creative resource. 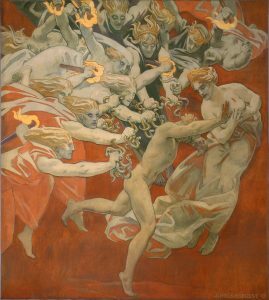 For example, their devised play does contain several elements and themes which are recognizably Aeschylean, and which we discussed: those opening chants draw on the ‘necromantic’ choral hymn of Persians and the ‘chthonic’ powers invoked through song in The Oresteia. And the play’s moral dimensions have certainly gained more texture and complexity after discussions with the group about Euripides’ Medea and Sophocles’ Oedipus Tyrannus. This is the great thing about Greek tragedy: whatever you’re trying to say or create, it’s good to think with. So, we’re not too worried about how far the final product conforms to academic definitions of Greek tragedy in aesthetic and formal terms. The most important thing is for the group to use the ancient material as an intellectual and creative tool, and have fun doing so, in order to produce a performance which speaks to a contemporary audience and which is genuinely theirs. That choral chant really makes for impressive reading, doesn’t it? But this is as nothing compared to the amazing experience I had when I saw it performed for the first time in a rehearsal last Thursday. Two group members acted it out for me in their role as Fury-like banshees. As their chants and movements build in intensity and coordination, they summon up the spirit of a deceased politician. He must stand trial for alleged crimes committed while he was still alive. The trial takes place in a realm which is intermediate between that of the living and the dead; something akin to the Tibetan Buddhist state known as ‘Bardo’. The case against the politician is developed through the testimony of three characters: his wife, a colleague and a political opponent. The allegations are serious: in a post-apocalyptic world experiencing severe shortages of water, the politician has caused even more suffering for his community. But is he really to blame? Can he defend himself successfully? And what will happen to his spirit if the Banshees convict him? Even I don’t know the answer to all these questions: the play itself is still being shaped and I don’t get to be at all the rehearsals. But I can’t wait to find out what happens in the end! This entry was posted in General on 25 May, 2017 by Jon Hesk. These two phrases are key slogans or ‘soundbites’ in the Conservatives’ 2017 general election campaign. They deploy ‘alliteration’, a rhetorical ‘figure of sound’ which Cicero loved to use (although he also disapproved of an excessive reliance on it). Alliteration is implicitly recognized for its rhetorical power as far back as the 5th century BCE Greek sophist Gorgias. An ancient Greek word for it is paroemion, although this label seems not to have been coined until the 1500s. Alliteratio as an actual rhetorical term also seems to derive from the rhetorical handbooks of the early modern period. [On both these points I confess to limited research and am happy to be corrected]. Alliteration gets defined in different ways these days. Some restrict it to the frequent repetition of initial consonants in close proximity to each other. Others define it more broadly as ‘repetition in the initial sounds of words that can produce echoes of phonetic similarity throughout a text’ (Fahnestock 2011). I quite like this one from the Silva Rhetoricae website: ‘Repetition of the same letter or sound within nearby words. Most often, repeated initial consonants’. Historians and psychologists of political rhetoric talk a lot about the way in which 20th and 21st century communications have fundamentally changed the nature of political persuasion and communication by comparison with the days of Gorgias, Aristotle and Cicero. But alliteration is one device which is particularly suited to the era of ‘soundbites’ and Twitter. It seems to be more popular than ever with politicians and spin doctors. In a book by a very experienced political speechwriter called Winning Minds. Secrets From the Language of Leadership, we get some sense of why ‘alliterative pairs’ like ‘Strong and Stable Leadership’ or ‘Coalition of Chaos’ and are so effective: ‘they reinforce a sense of balance’ (Lancaster 2015). Balanced and ordered phrasing, argues Lancaster, is something which audiences warm to at a neurological level, regardless of whether it maps on to anything meaningful or true. But alliterative phrases also create powerful impressions and associations. Jeanne Fahnestock offers examples of ‘alliterative triplets’ where ‘the repeated opening consonant helps the rhetor produce the impression of a coherent set’. She cites Lyndon Johnson: ‘So I want to talk to you today about three places where we begin to build the Great Society—in our cities, in our countryside, and in our classrooms’. In the case of ‘coalition of chaos’, it is pretty obvious what ‘coherent set’ of associations the Prime Minister is aiming to produce. Another reason why slogans and soundbites so often deploy alliteration is that they are much more memorable than those which do not. Alliteration has been proven to work very well in aiding memory and the recall of information in educational contexts. When it comes to political messaging, then, short alliterative phrases can be the best way to get the electorate to both understand and remember what you stand for, not to mention how you want them to think about your opponents. Soundbites and sloganeering are often decried as symptomatic of an era in which political debate and democratic discourse have become debased and hollowed out. The leader of the Labour Party is explicitly rejecting ‘the stuff of soundbites’ in this campaign. This is part of his own rhetorical claim to authenticity and to stand for a new kind of politics. But there are real risks to this strategy given the nature of modern media communications and the power of the most memorable and quotable slogans to set the terms of an electoral agenda – and to do so in favour of the party that comes up with them. This entry was posted in General on 1 May, 2017 by Jon Hesk.